Six Victorian students have won awards in The Parliament Prize for 2017, presented at Parliament House. The winners were announced by Legislative Council President Bruce Atkinson and Legislative Assembly Speaker Colin Brooks, who presented the awards at a ceremony held at Parliament House attended by the students, their families, teachers and a number of MPs. Third prize: Felix Geake-Ransome (Haileybury College). In the years 7-9 category, Adam Galletti’s video provided an entertaining and insightful assessment of the digital platforms parliament can use to connect with young people. For the years 10-12 prize, Zahra Ali imagined the ‘DemoCritic’ app that could bring a new level of connectivity between parliament and the people it represents. 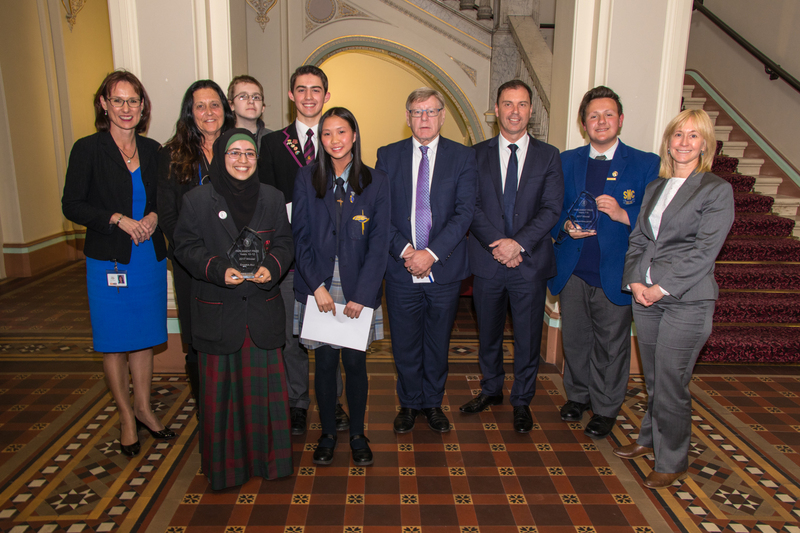 Parliamentarians Melina Bath MP and Chris Couzens MP, who served on the judging panel with the Presiding Officers, took part in the awards presentation, along with fellow judge Tony Kuc from the Victorian Parliament’s education advisory panel. The winning entries are available from The Parliament Prize webpage.